Symach has announced that Chad Seelye has been appointed to the role of vice president USA for the Italian-based company, effective Oct. 3, 2016. In his new position, Seelye will work in collaboration with the team in Italy to educate the US market on Symach’s unique high-quality European technology and equipment, which includes its patented FixLine process. Since expanding to the US market two years ago, Symach has set up five new body shops across the North American market. As vice president USA, Seelye will be based in Dallas, TX and help further expand Symach’s offerings in the United States. “I am looking forward to educating the US market on the Symach approach to collision repair and how to best leverage its game-changing SAP (Symach Application Process) and Drytronic drying technology,” said Seelye. Both SAP and Drytronic technology are compatible with all brands and types of automotive paint systems. The company’s patented Wave Length Control System (WLC) allows for the management of the various wavelengths based on the paint’s brand and type. All Symach equipment and technology have been tested and approved by Intertek for installation and use in North America. Over the past two months, Seelye has spent time in Italy with the Symach team and in body shops that have installed and implemented the Symach FixLine process. “I am extremely impressed with the quality of engineering, the equipment and the people. They are all top notch,” he said. 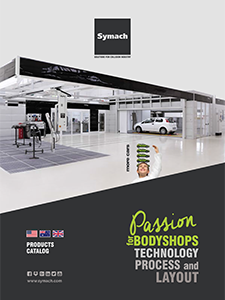 “Symach is more than just an equipment manufacturer, it is a body shop solution provider. Symach matches the needs of the business with processes and the proper equipment to dramatically increase throughput while significantly decreasing cycle time. Simply put…Symach is a game-changer. For more information, contact info@symach.com.